This weekend I took a last minute trip to Nottingham, which is a place I am now referring to as ‘the place of burger and exploring dreams’. Nottingham has always been a place which I’ve not really been that interested in going to for touristy things. I don’t know why though!? I always kind of dismissed it. I’ve been before a few times many years ago, for gigs and a few nights out at Rock City, but I’ve never actually explored the place. I can now say that I honestly think I’ve been missing a trick and mugging myself off a bit, as it’s pretty bloody wonderful! As soon as I knew I was going, I took to Twitter and asked for food recommendations. The crowd went wild and I got so many recommendations for Annie’s Burger Shack. 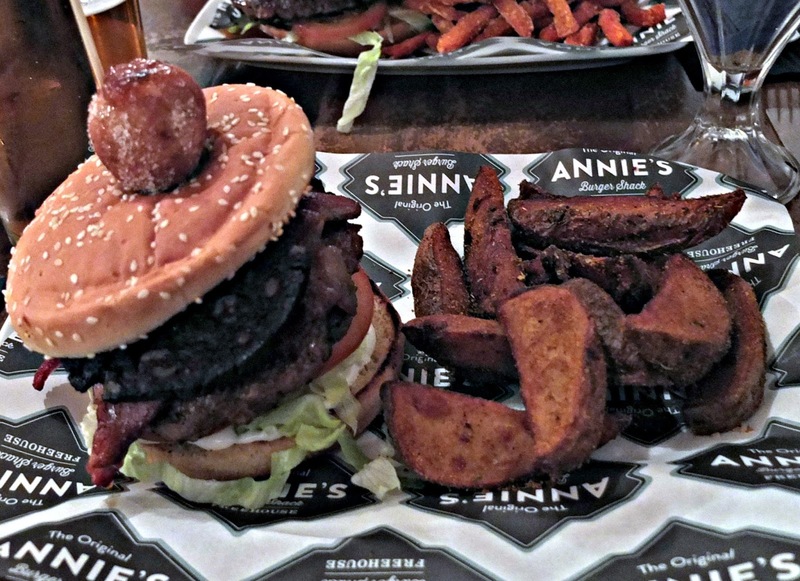 I checked out the Annie’s Burger menu and just knew I needed to add it to my little hit list for the weekend. We tried to go Annie’s at around 3.30pm, but they were so busy that we had to book in for a little bit later and come back. This is always a pretty good sign I feel. Whilst we pottered around waiting, we did check out the menu a little more so we could go prepared, but the decision was pretty hard despite this time for planning. After thumbing over ‘The Elvis’, ‘The Hawaiian’ and the ‘Gringo’ I ended up settling on one of the even more unusual choices, in the form of the Johnny Vegas Burger. As you can see, the Johnny Vegas Burger packs a punch just for the eyes. So as you can imagine, eating the thing was a challenge within itself. The size of the burger alone was slightly larger than you’d usually expect at somewhere like GBK for example. Not only did it have a deliciously thick beef burger as a base, but the burger was made up of *clears throat* black pudding, crispy bacon, warm toffee apple butter, sweet chilli paste, and a little Guinness doughnut stuck on the top. Drool. Served with the absolutely amazing Cajun chips on the size, I was in burger heaven. For around £12 per meal, the prices are really reasonable too. All burgers include a choice of fries, chips, Cajun chips or sweet potato fries; which is a welcome addition when you consider that horrible trend of burger places charging separately for sides. 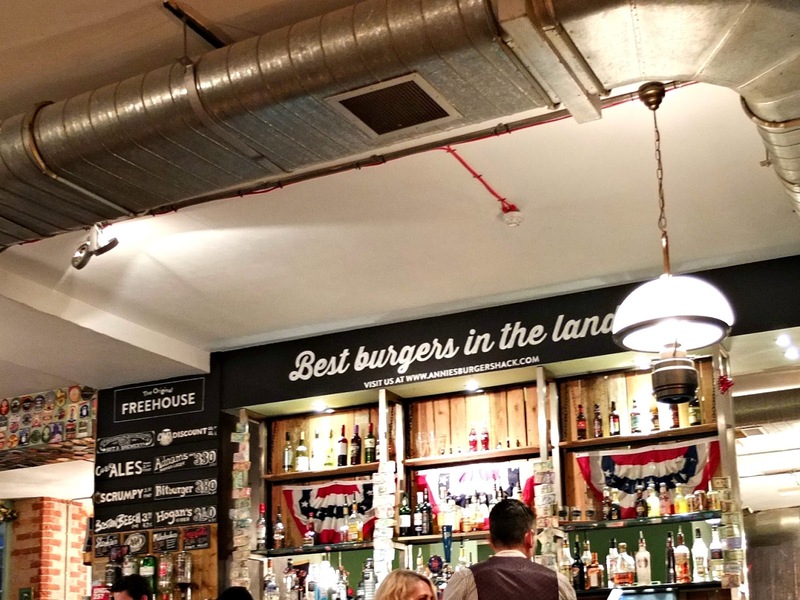 I really can’t wait to go back to Nottingham and back to Annie’s to try even more burgers on the menu. Solid 8/10 for this bad boy from me. Next Post I Like The Way You Work It.